Computational intelligence is a study of stochastic search, optimization and learning methods, inspired by physical and biological systems. Research in this area at the Department of Intelligent Systems focuses on the evolutionary computation methods. We study extensions of evolutionary algorithms for multiobjective optimization and their parallelization, and apply these algorithms in engineering design and optimization problems. In this project we are developing optimization support for scheduling of flexible offers for energy production and consumption, which is becoming important with recent changes in energy systems, such as integration of renewable energy sources, emergence of entities acting both as energy producers and consumers (prosumers) and dynamic tariffs. The goal is to develop an efficient scheduling algorithm to minimize costs due to mismatch between available and needed energy, and evaluate its effectiveness and efficiency on real-world problem instances. Only a few real-world multiobjective optimization problems are freely available for research purposes. Therefore, there is an urgent need to collect real-world problems, models of real-world problems and more realistic synthetic benchmark problems into an open benchmark suite that could be used by any researcher in multiobjective optimization. The idea of this project is to extend the state-of-the-art open-source COCO platform by incorporating real-world problems and their properties in order to bridge the gap between research and application in multiobjective optimization. This tutorial provides a comprehensive overview of methods used in multiobjective optimization for visualizing either individual approximation sets or the probabilistic distribution of multiple approximation sets through the empirical attainment function. This tutorial presents the challenges faced and lessons learned in designing evolutionary algorithms for industrial optimization problems that go beyond the textbook knowledge on optimization and evolutionary computation. It starts with defining the scope of the presentation and providing motivating examples of industrial applications with diverse characteristics. The core of the tutorial is a systematic analysis of the potential challenges illustrated with practical situations, followed by an overview of the lessons learned in dealing with these challenges when deploying evolutionary algorithms. It is the ambition of the tutorial to both promote evolutionary computation as a practical problem-solving methodology and contribute to bridging the gap between the algorithm designers and end-users. Demanding real-world optimization problems with multiple objectives can be solved more efficiently if parallelization is used to execute a number of simulations simultaneously and if the the time-consuming simulations are partly replaced by accurate surrogate models. In this twinning project, JSI’s Computer Systems and Intelligent Systems departments were strengthening their research and innovation potential in parallelization and surrogate modelling, and exploring the potential of combining the two techniques in smart multi-objective optimization in collaboration with the University of Lille and Cologne University of Applied Sciences. A simulation-based multiobjective optimization software was developed to support continuous casting of steel on a new casting device at the Štore Steel plant. It considers the manufacturing process parameters as optimization variables, and deviations from the target values of the process output variables as optimization objectives. The software is installed at the plant and used as a tool for achieving higher product quality. This bilateral collaboration between Shinshu University, Nagano, Japan, and the Jozef Stefan Institute aimed at advancing the methodology of evolutionary multi- and many-objective optimization for real-world applications. The partners have particularly focused on optimization and visualization in many-objective space trajectory design. The COPCAMS project aimed at exploiting new many-core programmable accelerator platforms to power a new generation of vision related devices (smart cameras and gateways) able to extract relevant information from captured images and autonomously react to the sensed environment by interoperating at large scale in a distributed manner. This project aimed at advanced modeling and simulation of liquid-solid process. Its idea was to focus on enhancement of the physical modeling capabilities and further development of numerical methods for liquid-solid processes. This project aimed to couple the already developed and new physics-based computational models for continuous casting, rolling, and heat treatment into a multiscale through process model of the whole steel production sequence. Implemented in the form of a web and mobile game (for iOS, Android and Windows tablets), e-Pedius engages users with an affinity for solving jigsaw puzzles in the Slovene cultural heritage preservation process. This project was aimed at developing a conceptual and infrastructual approach that allows energy distribution companies to efficiently manage higher amounts of renewable energy and balance energy supply and demand. The goal of the project for the Restoration centre of the Institute for the Protection of Cultural Heritage of Slovenia was to develop computer-aided support for restoration of wall paintings from fragments. We developed a system called Pedius that enables digitalization, recording and assistance in putting the fragments together to form the original wall painting. The system considerably shortens the time needed for restoration and prevents further damage to the fragments. The goal of this doctoral research is to develop effective and efficient multiobjective optimization algorithm for solving hard numerical problems, where solution evaluation is computationally expensive. To achieve this goal the algorithm builds a surrogate model of the original objective function. With this surrogate model some solutions are then approximated and are used in the optimization process. Project accomplished with a successful Ph.D. dissertation defense in April 2015. This doctoral research addresses two distinct tasks in visualization in multiobjective optimization—visualization of approximation sets and visualization of empirical attainment functions (EAFs). 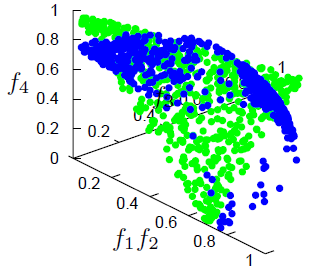 In the first task it aims at developing a method for visualizing approximation sets that preserves the Pareto dominance relation between as many visualized points as possible. In addition, it presents a comprehensive review of the existing visualization methods used in evolutionary multiobjective optimization, showing their outcomes on two novel 4D benchmark approximation sets. In the second task the research addresses the visualization of exact as well as approximated 3D EAF values and differences in these values provided by two competing multiobjective optimization algorithms. Project accomplished with a successful Ph.D. dissertation defense in September 2014. The goal of this doctoral research is to improve the methodology for discovering driving strategies. We proposed and developed a multiobjective optimization algorithm that searches for driving strategies using a black-box vehicle model and minimizes the traveling time and the fuel consumption. Tests on data from real-world routes show that the proposed algorithm finds better driving strategies than the existing algorithms. Project accomplished with a successful Ph.D. dissertation defense in January 2014. The 13th International Conference on Parallel Problem Solving from Nature, PPSN 2014, was co-organized by the Department of Intelligent Systems and held at the Ljubljana Exhibition and Convention Centre on September 13-17, 2014. The conference brought together researchers and practitioners in the field of natural computing, i.e., the study of computational systems that use ideas and get inspiration from natural systems, including biological, ecological, physical, chemical, and social systems. The conference proceedings are published in Lecture Notes in Computer Science by Springer.